After painting up the battle box I wanted a change of pace and instead of painting up another myrmidon, chose the Destor Thane to do next. It would be a good test model for how the scheme would look for when I began painting Vyros2. The scheme is the same as previously detailed (ad nauseum), what is worth detailing is how I painted the horse, as it was first attempt at this particular scheme. 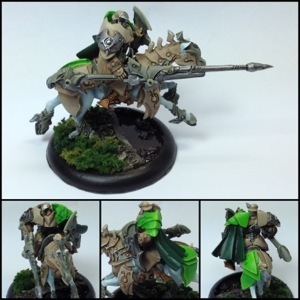 I knew that I wanted to try a pale horse to tie it back to the studio scheme, but didn’t know where to start. I primed white, as is my way, and choose to put down some Trollblood Highlight as the first shade. To darken it, I used a mix of Trollblood Base and Exile Blue, lightly applied. The darkest areas used a thin coat of Exile Blue to finish it off. It looks a little icy, but I like how it came out.